Circle of Blue reporter Brett Walton tastes the iconic river. 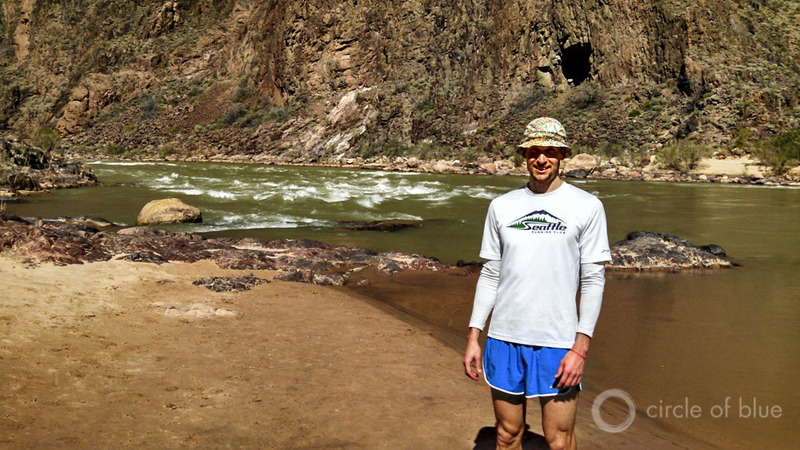 Circle of Blue’s Brett Walton stands by the Colorado River, in Grand Canyon National Park. Click image to enlarge. Grand Canyon National Park, Arizona — The sunlight had not yet flooded the river’s inner canyon on the morning I met the Colorado. The temperature on this March day would reach 87 degrees Fahrenheit by the afternoon, but just after daybreak the sand bars on the river’s edge still held the memory of a cool spring equinox night. Having just descended the Bright Angel trail from the Grand Canyon’s South Rim, I stood before a river that to me was both intimate and obscure. I have reported on the Colorado River for five years. I know it as a legal argument, as a topographic feature, as an obstacle, and as a matrix of charts, calculations, and grim projections. I’ve read its case law. I’ve driven across its two monumental dams, and I’ve admired its curves through an airplane window. Its history — legal, political, environmental — is as vivid to me as any river’s. Yet, until this week, I had never touched its waters. Feet swollen from the 4,460-foot descent and body breathless but euphoric, I removed my shoes and walked across the soft sand of Pipe Creek beach. The water appeared emerald or olivine depending on the angle of the sun. I bent low, bringing my lips to the river and took a drink. The water tasted heavy, as if it were just as much earth as water. 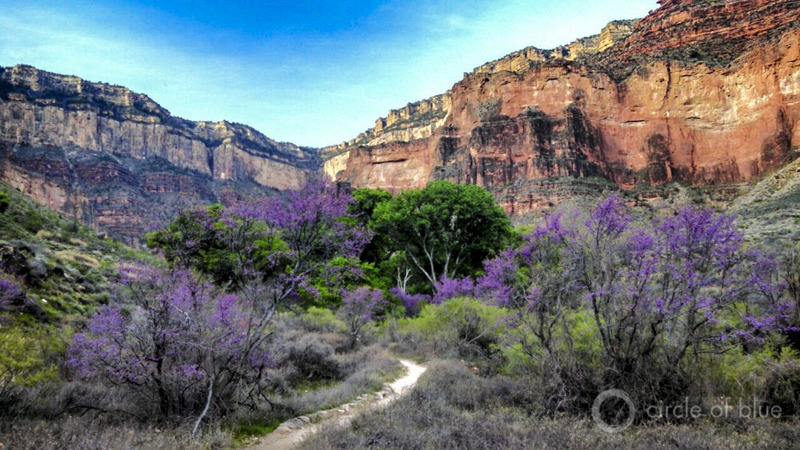 Vibrant green cottonwoods and bright Western redbud trees grow near a spring-fed stream at Indian Garden, halfway down the Bright Angel trail at Grand Canyon National Park. Click image to enlarge. This is how we used to drink, faces mirrored in the rivers and springs that vein the land. That connection between source and sip was severed when long pipelines, canals, and aqueducts allowed societies to move water from distant mountains to dense urban cores. This is as true of modern-day Phoenix and San Francisco as it was of ancient Rome. But seeing a river face-to-flow is a return to first principles, especially for the Colorado and its tributaries, which are piped to homes in Albuquerque, Denver, San Diego, and Salt Lake City — none of which is located in the river’s natural watershed. “Neither the biggest nor the longest river in the American West,” wrote the journalist Marc Reisner in Cadillac Desert, a classic of water reporting. But the Colorado is certainly the most important politically, economically, and socially. Some 40 million people in seven Western states and Mexico use its waters, which also irrigate millions of acres of desert farmland. That scale of dependence is hard to imagine standing in a canyon where the river is narrow enough in places to throw a rock across.